In 2016, the fundamentally undemocratic U.S. two-party system presented the public with the two most hated candidates in history. The choice was so dismal that over forty three percent of the voters could not bring themselves to go to the polls. Everyone hated one or the other of the candidates, or both. Whoever won was bound to face vehement opposition. 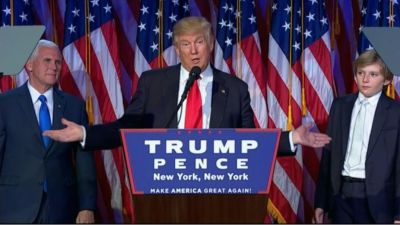 The unexpected shock of Donald Trump’s victory created mass hysteria, with crowds in tears going into the streets to protest – an unprecedented reaction to an uncontested election. This hysterical opposition is not the best basis for building the new movement needed to oppose a widely rejected political establishment. Most of the weeping and wailing comes not from Bernie Sanders supporters, who were prepared for the worst, but from those who believed the Clinton campaign claim that Trump represents nothing but various ways to “hate” other people: sexism, racism, homophobia, xenophobia, etc. The response is to hate Trump. This is sterile and gets nowhere politically. Trump’s reputation as a racist fiend is largely based on excessive remarks such as his outrageous promise to build a wall to keep Mexican immigrants from entering the country – outrageous, in fact, because the wall already exists! Except that it is called a “fence”. Washington is not about to be ruled by Nazis, but by reactionary Republicans, which are bad enough but nothing new. If Trump is better than they are on some points, that should be noted and encouraged. An effective opposition should know how to distinguish between hot air and real issues, and to judge issues on their own specific merits. The Clinton campaign was based the “identity politics” claim to protect women and minorities from their enemy, Trump. An opposition movement based on perpetuating that claim, with emphasis on how horrible Trump must be personally, is also likely to swallow other aspects of the Clinton campaign line, notably its anti-Russian propaganda. Incited by the mainstream media, the “left” opposition risks echoing the Clintonist accusation that “dictator” Trump is too friendly with “dictator” Putin. And the hysterical opposition will oppose the one positive element in Trump’s campaign: the desire to make business rather than war with Russia. It is significant that the German Defense minister Ursula von der Leyen wasted no time in demanding that Trump choose between friendship with Putin on the one hand or NATO and “our shared values” on the other. This is a sign that not only the U.S. war party but also the European NATO machine will be putting pressure on Trump to pursue the very same warlike policies favored by Hillary Clinton. And the disappointed Clintonite opposition is likely to be out in the streets not to oppose wars, but to oppose Trump’s opposition to wars, all in the name of our shared democratic humanitarian values and opposition to “dictators”. This is the danger of hysterical opposition to Trump. It would be a continuation of the worst aspects of this dreadful campaign, totally centered on denouncing individuals, and neglecting serious political questions. A progressive opposition should leave Clintonism behind and develop its own positions, starting with opposition to regime change wars – even if Trump is also against regime change wars. And indeed, it should push Trump to maintain that position, because he will be under strong pressure in Washington to give it up. The opposition should demand that Trump make good on his promise to avoid war, while opposing his reactionary domestic policies. Otherwise, we are heading for the worst of both worlds.